So I finally got my blackspot sneakers from Adbusters. They are mighty fine shoes if I do say so myself. A lot of it just makes sense - old tire tread for grip, made with hemp as opposed to cotton, made under fair conditions in Portugal, and as an owner of the shoe I am also a stockholder in the corporation. 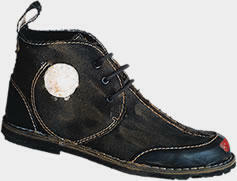 The best part is that they are designed by Fluevog - so they have some style as well. I'm not really that interested in being a part of a counter-culture flag waving movement, so the first thing I did was colour in the ugly white spot on the side and paint over the red spot on the left toe. I also have a hard time buying into blackspot as anything other than a brand in itself. Being in advertising, I can tell you that there is no such thing as an anti-brand. The only complaints I have is the name 'un-swoosher, and the spots, other than that they are comfortable, lightweight and full of bounce - with good traction - and they have a colour that goes well with almost any pants. It did take me a year and a half to get them (I originally ordered a pair in June 2004) and it took a lot of emails and phone calls and trips to the bank to clear out visa accounts that were supposed to be closed to finally get them, but I've got them now, and I'm pretty happy with them overall. That said, I'm happy to give them a plug. This should be the future of manufacturing.